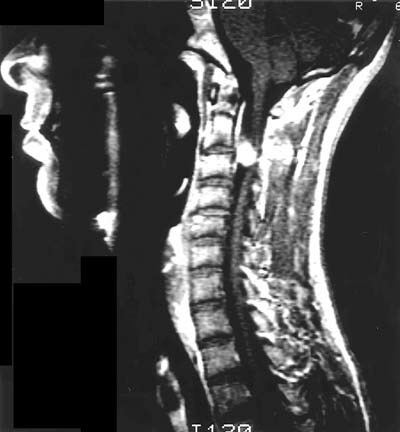 A 26-year-old male with a history of AIDS (CD4 count 20) and CNS toxoplasmosis (treated 4 years ago), complained of intermittent headaches and progressive neck pain. 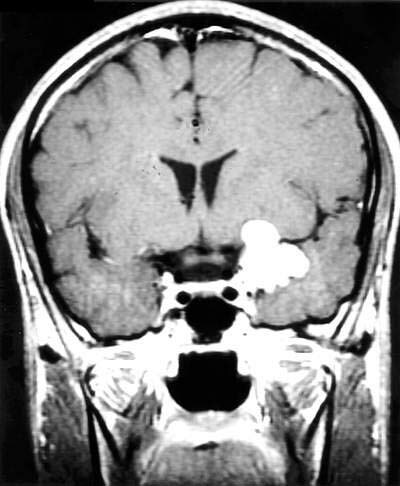 An MRI of the head and neck showed a 2 x 3 cm enhancing mass in the area of the left sphenoid wing (Figure 1) and a right-sided 2 x 2 cm enhancing intradural, extra-axial mass at the level of C2-3 (Figure 2). The patient underwent two separate surgical procedures revealing similar firm, hard, smooth, white/tan, irregularly lobulated masses.